At first glance, the marker is not at all out of place. The sign is located in the hamlet of Jackson Corners on the Roeliff Jansen Kill, a 56-mile tributary of the Hudson River that is considered to have been populated by the Mohican. The hamlet is technically in Dutchess County’s town of Milan, but borders on Pine Plains, the location of Shacomeco village, and Columbia County’s Gallatin. The Moravian missionaries’ venture to convert Native Americans to Christianity at Shekomeko is well documented. Lasting from 1742 to 1745, it quickly became controversial. Not everyone was supportive of the “advancement” or integration of native people. In 1744, the colonial Governor ordered the group to “desist from further teaching and depart the province.” The eviction order, combined with calls for assassinations by locals, drove those who remained at the mission to relocate to Connecticut and Pennsylvania in 1745. But this thorough documentation (much of it in the Moravian’s subsequent refuge in Bethlehem, Pennsylvania) also reveals gaps in the Chief Crow story, of which no record has yet been found. And certainly any converts who were “of Moravian Faith” would have been required by law to leave in 1745, 105 years after the so-called “last burial” date identified on the historic sign. The graveyard’s headstones are no help. The remaining five stones (decades ago eight were mentioned) are mere stubs and have no visible writing. And in addition to the gap in time, there is a gap in location, Shekomeko is 15 miles southwest. And there is one more notable gap. There was a major county-wide survey of 19,000 graveyard inscriptions published in 1924 (Poucher and Reynolds) that documented even very small Milan burial grounds (they found a total of 411 inscriptions in Milan). But that survey failed to mention the existence of this burial ground despite it being in a very visible roadside position. 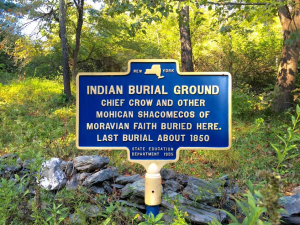 The only mention of Chief Crow found to date is a June 28, 1934 story in the The [Chatam] Courier (repeated the next day in the Rhinebeck Gazette) that reports on a recent meeting of residents in Gallatin (the town adjacent to the north of Jackson Corners) who had recounted Indian tales. The article is fraught with improbabilities at best, and more often impossibilities. At the meeting Herman Case told the story of his mother as a small child (this would have transpired around 1840 since we know her birth year). On her way to school she was frightened by the “war whoop” of the local Chief, Chief Crow. Seeing her startled Case related that he said “me no hurt little white gal” and picked her up in his arms, running with her to school and placing her gently on the steps. The article mentions the chief lived with his wife Nancy and 13-year-old granddaughter. The article says Chief Crow was given permission to live in a log cabin after selling land to white settlers. Given the timing of such transactions, this would have been anywhere from 100 to 150 years prior to his athletic sprint with the young girl in his arm. The host of the meeting is important to note, Mrs. C.V. Harrison. For it is she who would sign the paperwork, just over three months later in October 8, 1934, for the erection of the sign we see today, citing “old men of this section tell of their grandparents seeing these [burials] daily.” She submitted applications for over 100 signs in Dutchess and Columbia County. So to solve this mystery, I looked at another mystery. Why the past tense I wondered? The answer is that there had been an enormous exodus in rural Dutchess County of people both white and non-white. While cities were growing rapidly, rural areas started to decline in population after 1830, hitting a low point in the depression years of the 1930s. In 1820, Milan had a peak population of 1,846 that included 65 “non-white” people according to that year’s Federal Census. There were 18 enslaved individuals (slavery was not outlawed until 1827) and 47 “free-colored” individuals. Given Native Americans’ formal persecution and other lethal consequences like European disease, and given the lack of an Asian community, it is fair to assume that many of those 65 were African American or mixed-race. By 1930, there are only 622 individuals; two African American families, the Fraziers and the Jackson’s who families had been early, and rare, African American landowners in the area. The town had really changed over 160 years as it regained is prior population size, but where is there any evidence of this larger, pre-Civil War African American community? Evidence of who really rests at the “Indian Burial Ground” comes from prior land ownership. Milan Town historian Barbara Thompson, the first historian to formally raise questions about the burial ground in the 1970s, directed her inquiry to the early 19th century owners of the small plot of land, given the common tradition of burying one’s family on the homestead, especially prior to New York State’s 1847 rural cemetery act. There are two such small homestead burials near this site, Platner and Shear families, the later being right on the roadside like the burial ground in question. Prior lot owners Lyle and Bradford were African Americans who moved from New Jersey and Albany. The one-acre lot was created in 1821 by owner Frederick Bathrick and sold to Jacob Lyle for $50. We know a lot about Jacob through his Revolutionary War pension application between the years 1833 and 1838, including the sworn testimony of five individuals who testified on his behalf, including a judge, postmaster and a prominent citizen in New York City who directly observed him in service. He had a half dozen or so tours of duty in his native state of New Jersey between 1776 and 1780 as a Master Fifer, an armed guard of munitions and food stores, and a forage master herding cattle. An officer started to call him “York and/or Yorick” and the name stuck during his service. He came to Milan in 1813 at the age of 50 with his wife Betsey where he worked as a basket-maker. The 1830 census shows a girl under 14 living with them, indicating all three are “free colored.” Remember the newspaper article mentions a 13-year old girl, the “granddaughter of Chief Crow” rests in the burial ground, I wonder if there is a connection here? In 1831, Bathrick sold an adjoining lot to Nancy Bradford, an African American cook from Albany. Remember, the newspaper article suggests Chief Crow’s wife was called Nancy? Just a few years later in 1835, a few years into his five-year to-and-fro with Washington pension bureaucrats, Lyle borrowed $107 from his neighbor Bradford using his small lot as collateral. This caused him to default on his loan from Bradford in 1844. Although the small lot, the collateral, was purchased at auction by a friendly Nancy Bradford who no doubt let the aging couple remain on the land. But we find no more reference to the Lyle’s. I believe it is most likely the Lyle’s died and are buried in the burial ground we are discussing. Given the infirmities discussed in the pension application in years prior, I can not image they left Milan after living there 40 years. In less than six years after Nancy’s death, official land records related that the small lot was “commonly known or called Nancy Crow lot or place.” First appearing in deeds in 1871, the reference remains through to today’s deed. What prompted Nancy Bradford’s lot to become known as Nancy Crow lot? The possibilities include: 1) Nancy Bradford married Chief Crow and became Mrs. Nancy Crow, as suggested by the 1934 newspaper account; 2) It could be a crude reference to her color; or 3) “Crow” could emanate from Jim Crow as a derogatory reference to African Americans. Thomas Rice had launched the Jim Crow character, inventing “black face” in NY in 1828 in a song-and-dance routine that became an international sensation. Ironically, the 1935 roadside marking the “Indian Burial Ground” stems from the 1925 Regents Program created to recognize the 150th Anniversary of the American Revolution. And yet this marker fails to mention that a Revolutionary War veteran is the most likely person who rests there.